Notes: A major tourist attraction the castle is reasonably well sign-posted and is certainly easy to find - it dominates the local area. A car parking is available directly below the castle. The substantial remains of a castle built by the native Welsh including a hugely impressive gatehouse. Also visible are the remains of the outer defences which were added by Llywelyn ap Gruffudd and Edward I. The site offers superb views over the surrounding area including, on a clear day, views of Snowdonia. 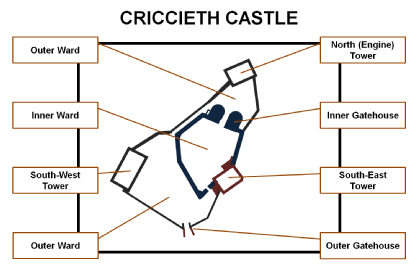 Criccieth Castle Layout. The castle consisted of Inner and Outer Wards which were built at different times. In recent decades there has been debate about which sections were constructed first and by whom. Despite the similarities between the Inner Gatehouse and Norman constructions, it is now believed the entire Inner Ward (including the Gatehouse) were constructed by Llywelyn ap Iorwerth whilst the Outer Ward was added later by Llywelyn ap Gruffudd. North (Engine) Tower. The north tower originally housed throwing machines enabling the garrison to command the entire area. Situated on a rocky promontory overlooking Tremadog Bay, Criccieth Castle was built as a statement of power by Llywelyn ap Iorwerth. The site was later upgraded by Llywelyn ap Gruffudd and then the English following the Second War of Welsh Independence. Besieged on several occasions it was finally destroyed by Owain Glyndŵr. By the early thirteenth century, Llywelyn ap Iorwerth had established his sole power over Gwynedd - a region centred around Snowdonia which was the pre-eminent Welsh kingdom. Although this brought him into conflict with King John - resulting in the English King sweeping through Wales - it ultimately helped unite the disparate Welsh princes under his rule. Thereafter he sought to cement his power with a number of castles and it was probably he who built Criccieth, replacing an earlier fortification at Dolbenmaen, around 1230. The castle was certainly in existence by 1239 as it was referenced in the Brut y Tywysogyon when Gruffydd ap Llywelyn (son of Llywelyn ap Iorwerth) was imprisoned there by his half-brother, Dafydd. Llywelyn ap Iorwerth's castle is believed to have been what is now regarded as the Inner Ward. Built upon the high sea cliffs overlooking Tremadog Bay, the site also offered excellent views towards Snowdonia - the heartland of his Kingdom. The castle's most substantial structure was the Inner Gatehouse, which also doubled as a Keep. This building consisted of double drum towers and it is likely the Welsh Prince was influenced in its design by the Norman Marcher Lords who were building similar structures - for example at Beeston and Montgomery castles. Llywelyn ap Iorwerth died in 1240 which saw the native Welsh lose influence. Henry III sought to assert his authority and at the Treaty of Woodstock (1247) stripped Gwynedd of control of all lands to the east of Conwy. In the subsequent decade, Llywelyn ap Gruffudd (the Last) fought to restore the dominance of Gwynedd including fighting a former ally, Maredudd ap Rhys Gryg, who was eventually captured and imprisoned at Criccieth Castle after siding with the English. Eventually Gruffudd was triumphant and at the Treaty of Montgomery (1267) was recognised by English and Welsh alike as overlord of Wales. However, the achievement was relatively short-lived as the Welsh Prince came into conflict with the new English King, Edward I, in 1276 starting the First War of Independence. 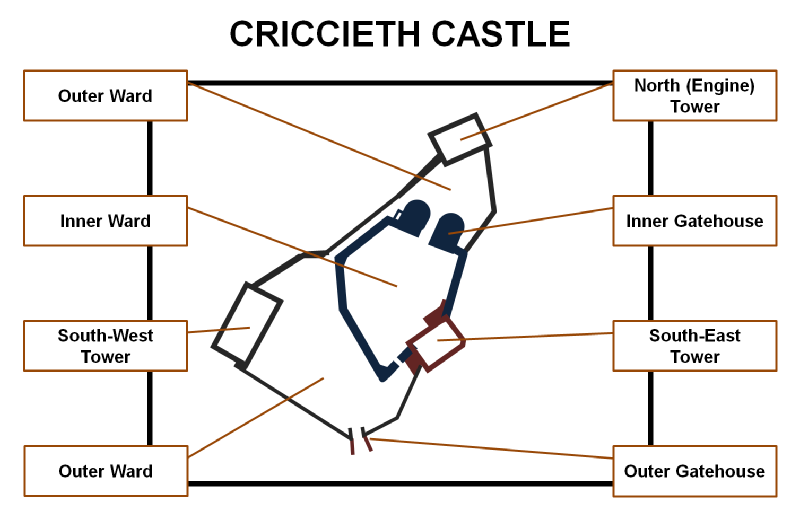 Criccieth's location, on the western extremity of the Gwynedd stronghold of Snowdonia, meant the castle saw no action during this first war. The Welsh Prince soon sought peace with Edward I - in which he lost control of all eastern Wales - but the settlement did not last. In March 1282 the Second War of Welsh Independence was initiated by Dafydd ap Gruffudd, brother to the Llywelyn. The Prince had little choice but to follow his brother and this time the English King resolved to conqueror Wales in its entirety. The country was overrun and Llywelyn killed whilst Dafydd fled to Dolwyddelan Castle which was subsequently besieged by the English in January 1283. Although Dafydd escaped, that castle quickly fell to Edward's forces and that force then marched against Criccieth. No records survive of any siege or fighting at the castle as part of this action but the castle was certainly in English hands by March 1283 as a Henry of Greenford was receiving pay as its Constable at this time. Following the Welsh defeat, Edward I spent significant funds building a chain of fortresses around Snowdonia. 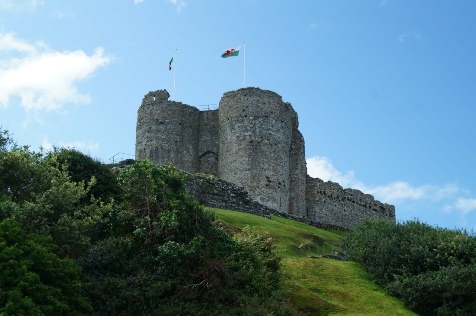 This included repairs and upgrades to some former Welsh castles including Criccieth. Indeed £353 was spent on undisclosed works at the castle between 1285 and 1292 - a sum significant enough for vast building works (as a comparison less than £200 was spent building the great Gatehouse Keep at Harlech Castle). Based on surviving masonry, it is assumed these funds were allocated to enhancements to the Inner and Outer Gatehouses plus improvements to the South-West and South-East towers. Criccieth Castle was one of a series of English outposts attacked in 1294 during the rebellion of Madog ap Llywelyn. However, along with Aberystwyth and Harlech, the castle's defences and waterfront location enabled the garrison to be re-supplied by ships from Bristol. All three fortifications weathered the rebellion until order was restored. 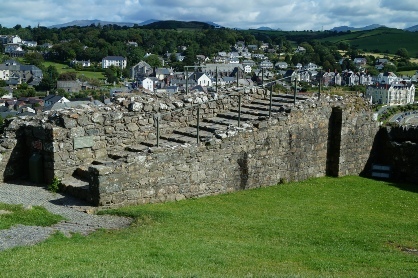 Whether any damage was done to Criccieth at this time is unknown but significant sums was spent on upkeep by Edward II (1307-27) and Edward III (1327-77). The latter granted the castle to his son Edward, (Black) Prince of Wales. It was he who appointed the first native Welsh Constable since the castle had been taken over by the English; Hywel y Fwyall was granted this honour following his exceptional service during the Battle of Poitiers (1356). In 1400 a rebellion erupted in northern Wales led by Owain Glyndŵr. The popular revolt, caused by excessive taxation and crass management, spread to engulf much of Wales. By late 1403 North-West Wales was almost exclusively in Owain's control with isolated English garrisons at Criccieth, Aberystwyth and Harlech. Due to French support - they sent a naval detachment to raid English shipping in the Irish Sea - the three castles could not be resupplied and by Spring 1404 they had surrendered to the Welsh Prince. To prevent any re-occupation by the English, Criccieth Castle was burnt and never rebuilt.